Bingo etiquette rules! Pun intended. The bingo industry is still thriving and the game has remained ever popular, particularly with players who are able to find solace in its social aspect where etiquette is the name of the game. Players can meet each other in traditional brick-and-mortar bingo halls, as well as, very conveniently, on online bingo sites. 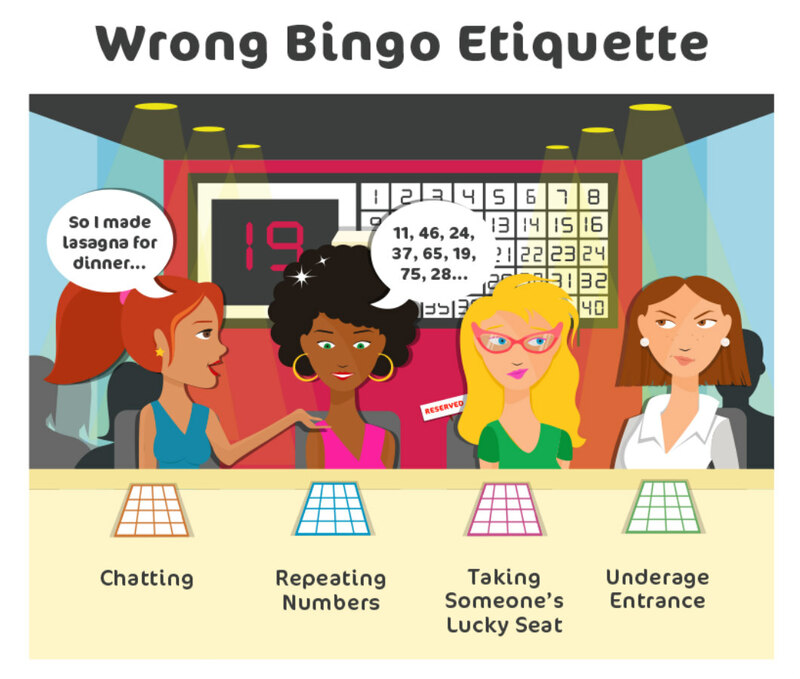 Whether the game is played in land-based halls, or online, or even via mobile bingo applications, all players are obliged to follow some form of etiquette. This will help maintain a calm, friendly and enjoyable environment in both online and offline situations without compromising on the fun. A bingo player who can follow etiquette rules is socially adept, and will tend to cultivate and cherish a deeper sense of belonging within their bingo community. Since the typical bingo aficionado enjoys a certain degree of routine, abiding by the rules will also deepen the familiarity factor. Having to stick to a set of rules may sound daunting, yet the benefits of doing so definitely outweigh the disadvantages. Etiquette rules certainly do not hamper the fun-factor. Remember! There is no freedom without rules. No two bingo halls operate in an identical manner and etiquette rules may vary from one to another. However, bingo enthusiasts would normally attend the same hall every time, making it easier for them to comply with the house rules. On arriving at the bingo parlour, players should read the posted rules prior to the start of the session. These are commonly presented in the form of handouts, and any additional rules pertaining to a particular game can be found at the end of the standard rules. Newcomers fear not! Bingo players are generally cheerful and social beings who will be more than happy to show you the ins and outs of playing at their bingo locale, especially if they see that you are having problems. Think Twice: Would You Alter a Bingo Card? With bingo being a highly interactive, social game, it is no wonder that noise can get out of hand every now and then. Bingo attendees can play a part here by keeping talk to a minimum, eliminating chit-chat altogether and talking only when required. Silence is golden especially when the numbers are being called. Players should make every effort to ask questions before the game begins, and when they need to query anything during the game, they should do so in a quick manner so as not to disturb anyone for very long. Refrain from asking the person sitting next to you to repeat what the caller said. Otherwise, you will pose the risk of missing the next number, apart from irritating your neighbour. Some people are in the habit of repeating numbers as they are called to help with their concentration while locating them on their sheets, but which can prove very distracting and irritating to their fellow players. It is recommended that you study the numbers beforehand to reduce the time needed to find them. Keep this in mind: Don’t be a parrot. If you are a newcomer to the bingo hall, chances are that you do not own a lucky seat as yet. In this case, watch out for the avid bingo player who loves to sit in their same seat each time they attend their bingo hall. People at bingo halls can be ultra superstitious, and finding their lucky seat can be one big priority. They might not always be able to get their seats though, because newcomers to the bingo hall will sit anywhere, having no knowledge as to who likes to sit where. Players are very attached to their ‘lucky seats’ – they’re almost like marked territory. If a player wins constantly one day in a certain chair, and then wins nothing the next time around when sat in a different chair, they will have it ingrained in their heads that their previous winning was due to the fact that they were sat in that particular ‘lucky’ chair. They feel the need to sit in that chair every time they play bingo in order to win. Why would they want another player to have the lucky powers of that seat? Newcomers can cooperate by staying away from the ‘owned lucky seats’ and if asked to change seats, they would ideally comply. You will establish your own lucky spot, and you will expect other players to respect that. Most bingo parlours specify that only people aged 18 years and over are allowed to play the game. However, there are some that restrict play for those above 21, so be sure to check before turning up at the hall. Most people will empathise with you if you need to bring your children to the venue, but they won’t tolerate boisterous behaviour that will interfere with their concentration and impede their hearing while the numbers are being called. If children must be present at the bingo hall, it is only proper bingo etiquette to keep them quiet during game play. Give your children some activity or items to keep them occupied, such as a video game, tablet computer or even colouring books. Some bingo halls offer fun bingo cards for children, featuring themed pictures and also words. On another note, if you had to take your friends to a game, it is advisable that you get them to purchase tickets. Some halls will let them enter for free, but best not to abuse this privilege. 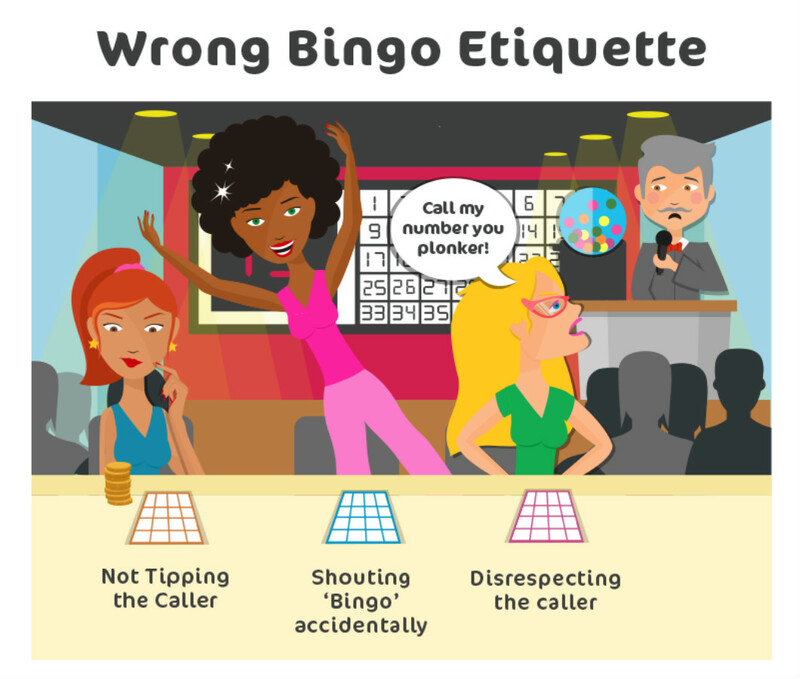 Another bingo etiquette rule is to respect the caller. If you’re having a bad day or are on a losing streak, then don’t blame the caller. There is no way possible that they can influence the numbers that are being drawn. Be heard only if the caller is too fast, or their voice is very quiet and you can barely hear them. Remember to be courteous while making the requests, and if that won’t work, take up the issue with the bingo manager. Do not call a false “bingo!” as this will stop the flow of the game and you’ll annoy other players, especially if they’d have already begun scrunching up their bingo sheets in disgruntlement. "Could I Have a Tip Please?" Have you ever wondered whether you should tip a bingo caller when you win? The answer to this is that there is no hard and fast rule as to whether you must tip or not. This is entirely up to you. Some bingo players like to tip when they hit a jackpot, and if you feel that you want to share a fraction of your winnings, you are safe giving about five to ten per cent. If you’re unsure about what to do, you can observe what other players are doing and then follow suit. Players do not usually tip at non-profit bingo since staff are voluntary workers. However, casino bingo is for profit, and staff expect tips even though they are paid. 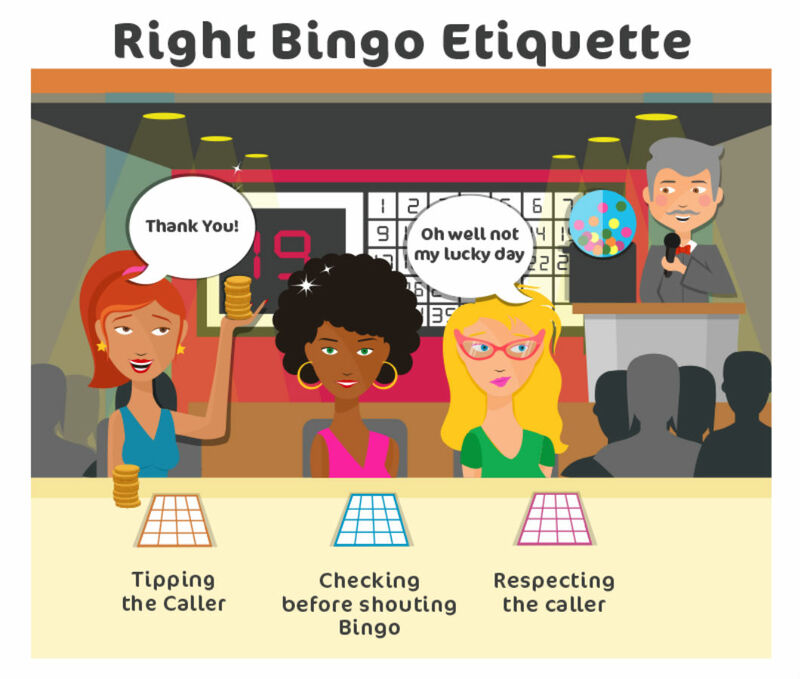 The online bingo scene is relatively new, yet there are quite a few similarities with the physical one, even when it comes to etiquette rules. Again, players are usually loyal to one brand and can quickly familiarise themselves with any house rules. While the etiquette rules for online bingo are much the same as for land-based, they are applied differently at online bingo sites. This is because the game is played from the comfort of the player’s own home, or anywhere on a mobile device. Rules are slightly less strict in the online scenario. However, again, they are the order of the day. The rule that online and offline bingo have in common is the ‘chatter’. However, chatting in online bingo sessions differs from its traditional counterpart. 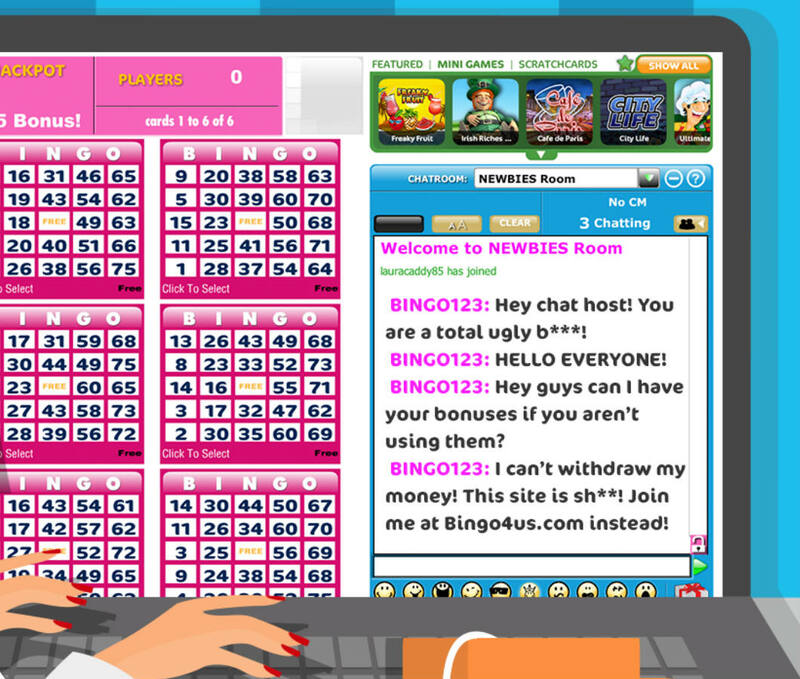 Firstly, an online bingo player can chat to their heart’s content with other players during the game. Secondly, they can choose whether to be social or not, as it is easier to ignore online chatter, unlike audible chatter in a physical bingo venue. However, despite the differences, the usual manners and respect shown in the bingo hall should also apply online. Always respect the bingo chat host. Players who distract or interrupt the host run the risk of losing their chat privileges for quite some time. Never type in CAPITAL letters unless requested to do so by the chat host. It’s normally only the host who uses CAPS, the purpose of which is to distinguish themselves from the players and so that players can single out the host who is in charge of running of the room. If you have spent all your money, do not ask other players for bonuses, gifts or cash at any time. Doing so can get you banned from the site. Never impersonate any of the players or the chat host. This type of behaviour is considered rude. Make sure to choose an appropriate user name. If you select a name that is not allowed or is deemed inappropriate by the chat host, they can ask you to change it. Arguments, harassment and disrespect towards other players are not tolerated. If you have a complaint, keep it out of the chat room. Complaining will disrupt the chatter, and the host won’t be able to deal with complaints anyway. Direct your issues to the relevant complaints department on the site. Never use inappropriate language in the chat room. This is where players meet, and the game must remain enjoyable for everyone. Do not solicit, endorse or promote other bingo sites. Doing so could get you removed from the site. Racial or sexual abuse is not acceptable! If you use words containing ethnic, racial or sexual references, you could be banned from the site, even permanently. 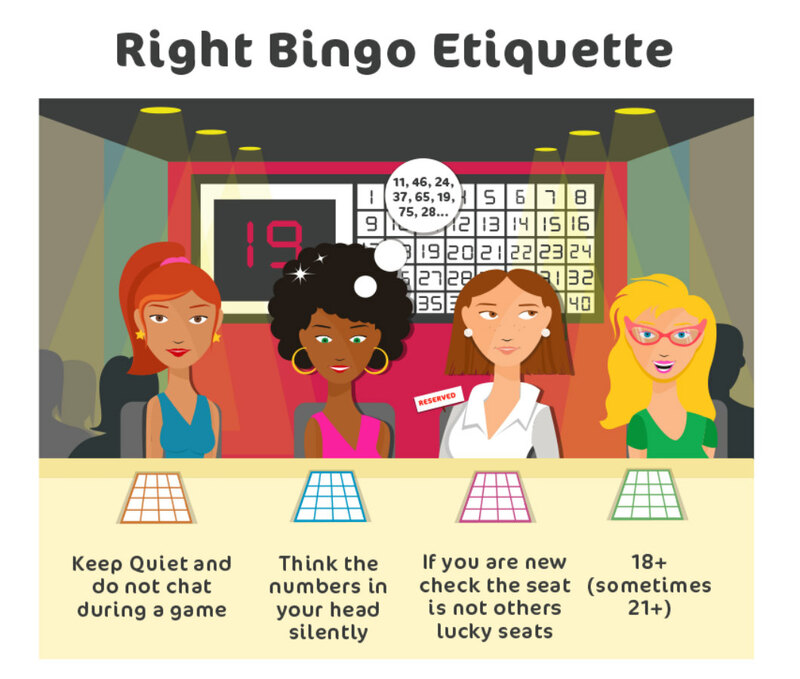 Following the bingo etiquette rules don’t necessarily mean pleasing other players. Rather, it is respecting other people’s needs, allowing them to enjoy the game. If everyone abides by the bingo etiquette rules, then you’re sure to enjoy a great game where all players can have a bucketload of fun!